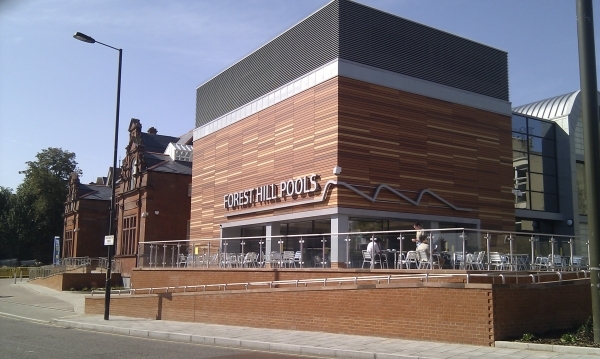 Local resident, and Mayor of Lewisham, Steve Bullock, will be speaking at the next Forest Hill Society General meeting on 10th May, 7pm at the Christian Fellowship Centre, Honor Oak Road (opposite Fairlawn School). 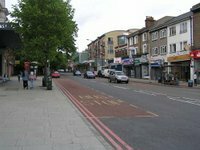 This is a chance for members of the Forest Hill Society and non-members to ask the mayor about council services in Forest Hill and across Lewisham. There will also be the first public consultation regarding plans for developing facilities in Horniman Gardens, so if you have any suggestions please come along and put them to the team from Horniman Museum and Gardens. Glorious weather awaited as 25 or more residents from across Forest Hill, adults of all ages and several intrepid youngsters, gathered on Devonshire Road to explore a local hidden treasure, the Devonshire Road Nature Reserve. The Reserve covers a large area along the tracks behind the houses on Devonshire Road (see map here). The Reserve functions almost exclusively with the work of volunteers. 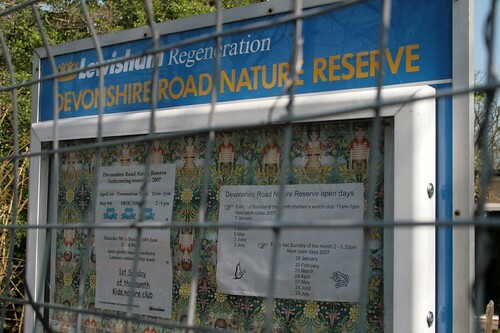 Nick Pond, in charge of nature conservation at Lewisham Council, gave us the introduction and tour. We also met Johanna Morley, Iris Borger and Tony Canning. Tony was our expert on all matters pond related. Iris manages the Wildlife Garden and also works with local schools to get younger residents involved with conservation, and Johanna is helping to energise more volunteers through the Friends of Devonshire Road Nature Reserve (if you want to know more, send her an email). The wildlife garden is complete with "luxury apartments" at the wood pile for Stag Beetles and lots of attractive, yet wildlife friendly garden features, including the amazing pond teeming with young toads and even newts. As Nick pointed out, wildlife gardening, and supporting local wildlife, like birds, butterflies, beetles and frogs does not mean you can't garden, but you need to think a little more and maybe incorporate some 'wilder' features. If nothing else, it means that leaving that flower bed unweeded and the pile of logs in the back is not laziness, but positive action for the environment! On our a gentle trek around the Reserve it was so peaceful, other than the occasional passing train, you could imagine yourself miles outside of the city. Nick explained how important these areas are to our local wildlife and what small steps we can take to help, such as limiting our use of slug pellets (that also kill birds and spread chemical debris), leaving areas of taller grasses to support the breeding of butterflies, building ponds to help frogs, birds, dragonflies and plants, and more. This is not untamed wilderness. There are open meadows, well maintained paths and the classroom has the important amenities! The Reserve is not ancient woodland so it is quite open, light and easy to walk. After 2 hours in almost 25 degree weather, the tea and cakes (home made by Iris and Johanna) were very welcome and quickly devoured whilst we rested in the sun. If you would like to take a look around it yourself, or even get involved, it is open in the afternoon of the last Sunday of every month. Iris is also there several days a week to welcome the school students to the wildlife garden, so you could speak to her there. Please do get involved, even if it is just for raising awareness of this local oasis. I'm sure they'd appreciate the support. To see more photos, you can click here. 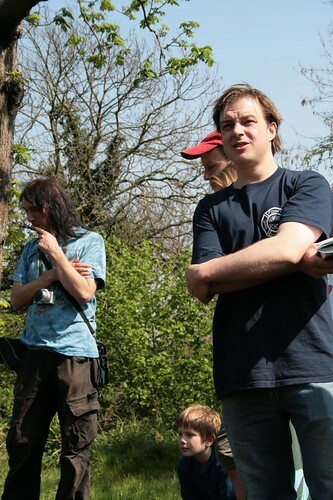 This Sunday 15th April, Nick Pond (who's in charge of nature conservation in Lewisham) will be leading a guided tour of the Devonshire Road Nature Reserve (entrance opposite Tyson Road). 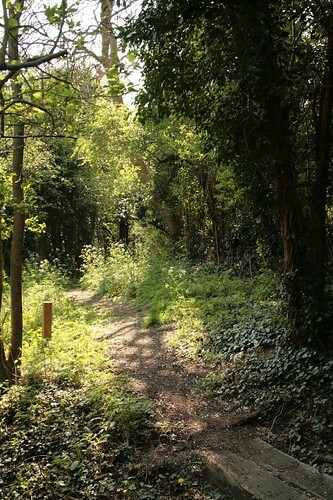 It's a great opportunity to explore this beautiful, secluded spot and learn about the rich biodiversity that SE23 enjoys. Iris Borger will also be on hand to talk about wildlife gardening. We're even promised refreshments! Meet at 2pm in the classroom. We look forward to seeing you there.